Hello Friends! Happy Sunday to ya! 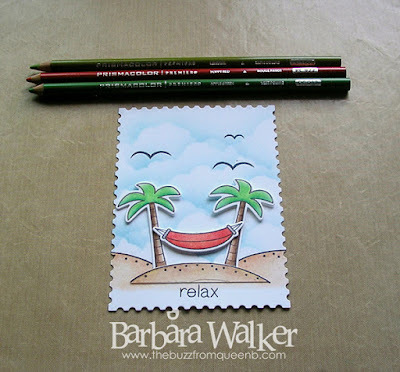 I'm on a roll with the Lawn Fawn Life is Good stamp set. Today, I used Prismacolor colored pencils and blended them out with gamesol. Does anyone else see a smile here?! LoL! 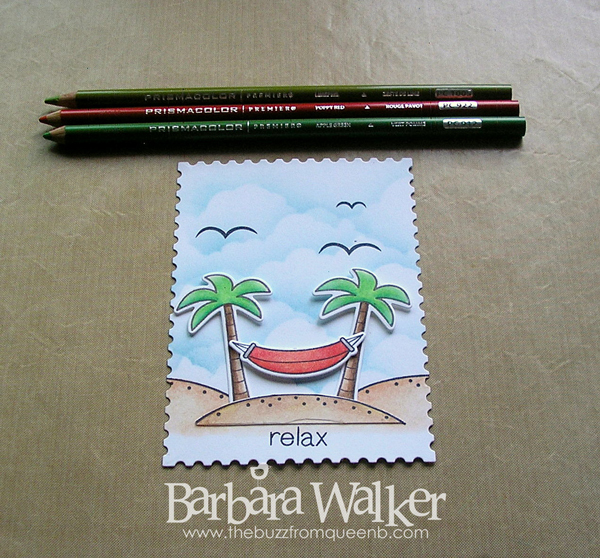 I stamped the sandbanks onto smooth white card stock and masked them off while I created the sky background. I used my cloud stencil and Distress inks for this. I stamped the birds with Versamark ink, because I wanted a dark black silhouette. For all other stamping, I used Memento Tuxedo Black. Next, I die cut the main panel using the Postage Stamp Edge die from Simon Says Stamp and colored in the sandbanks. I stamped the other elements onto scrap paper and colored them, too. Then, I die cut everything, assembled the pieces, stamped on a greeting and called it finished! That's it for me today! Thanks for stopping by, I appreciate the visit!